Spatial missions, sci-fi novels, movies about trips to Mars… Human’s fascination about outer space has led mankind to land on the Moon or build the International Space Station where people can live for months. In the 60s, people learned all about astronauts’ adventures thanks to books and TV. Today it is social networks which show first-hand what goes on in outer space. And if there is a clear winner in the use of Social Media, that is clearly NASA. Humans have always looked up into the sky and wondered what we can find out there. The dream of travelling to space became real in 1961 when Soviet Yuri Gagarin became the first human being to be in outer space (and came back to tell it). Since then, the spatial race sped up with the first manned travels into space, including the famous Apolo missions to study the Moon. Today we even send cars to Mars! But at the same time that space research has evolved, we who stay on Earth are also wanting to learn more. 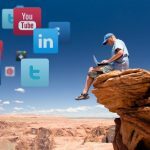 Progress in telecommunications make possible for astronauts to have internet connection, and therefore access to social networks. While their missions include complex research in the fields of biology, chemistry and mechanics, what terrestrials really want to know is what the daily life of an astronaut is like. What do they eat? What can the see from the International Space Station? How do they sleep with no gravity? NASA saw potential on social media as a platform to give people what they wanted: learn how astronauts live in space. Space research is very complex, and NASA knows that. This is why the agency has developed a communication strategy where they explain all kinds of phenomena or events in an easy and attractive way for all. The content ranges from technical data about the different missions they are working on, to pictures where you can see what hurricanes look like from space. 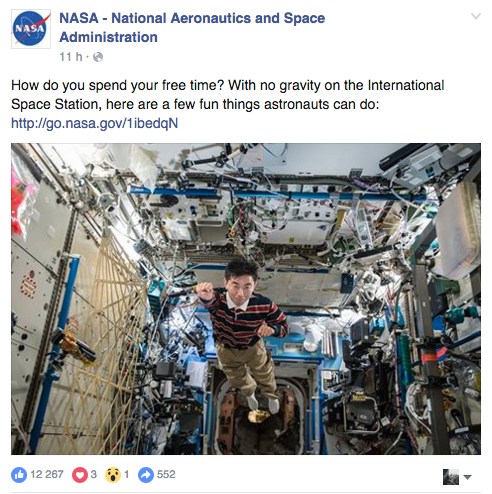 NASA also includes funny content such as “How to spend your free time under zero gravity” or “20 planets outside our solar system”. This kind of publications are the most successful, because they answer the questions that many of us make ourselves about what could we find out there. When your work is doing research on space, what you upload is really exclusive. Nobody else can go out there and take pictures of planets or dawns from space. NASA knows that this is its biggest strength and they must take care of it. This initiative has helped spatial missions get closer to the people and improve NASA’s public image, turning from being a Government agency to a source of information and entertainment with the goal of sharing knowledge and instructing the public. Houston, we have influencers on Mars! Pictures from space and details about the missions are cool, but what we like even more of NASA’s online strategy are the Mars Rovers accounts. 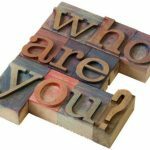 Both Spirit and Oppy, launched in 2004, and Curiosity, from 2012, have their own verified official accounts. 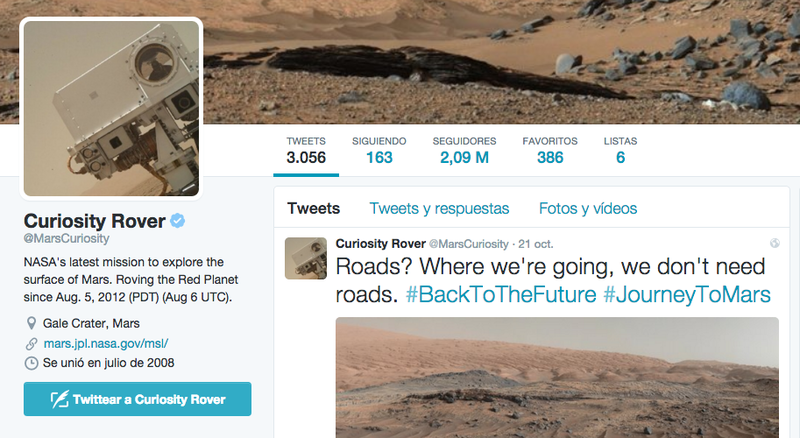 With 352,000 followers for Spirit and Oppy, and over 2 million for Curiosity, we could say that the Rovers have become the first influencers from Mars. Questions about space are still there, and there is still a lot that nobody can explain. However, thanks to NASA being present on different channels in social media, the agency has made possible that everything they learn, we can also learn via Twitter, all without leaving our timeline.